I have been WAY behind posting the monthly Retro Hottie of the Month. I'm now eleven days late with this one, and thought perhaps this time I'd do something different: I'm choosing not an actual actor, but a movie character. One of my favorite Kevin Spacey movies is 1997's "L.A. 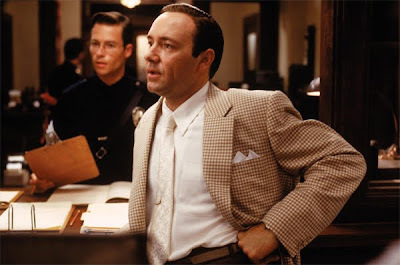 Confidential"; my favorite Kevin Spacey role is the one he played in it, Detective Jack Vincennes. By the way, if you've never seen this movie and you love movies set in other decades (which you must be if you're reading this blog), it's just a classic. It's set in 1950s Hollywood and follows a trail of corruption in the L.A. police department. It also stars a young Russell Crowe, Guy Pierce (two Australians who dropped their accents for the movie), Kim Basinger, James Cromwell, Danny DeVito, and one of my favorite character actors, David Strathairn. The cars, the sets, and the clothing are all gorgeous. 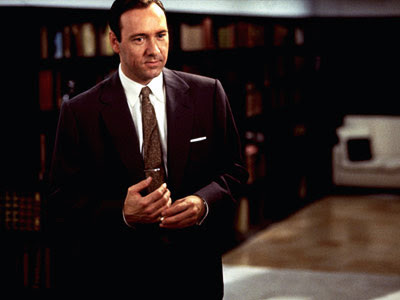 And so is Spacey - he never looked better, in my humble opinion, then he did while in this movie. In casting him, director Curtis Hanson told him to imagine his character as being very Dean Martin-like, with the suits, ties, and cufflinks to match. They gave him a hairpiece, too. His character comes across as a bit of a jerk at the beginning of the film, but then he slowly regains his moral values and turns into one of the good guys. He just oozes coolness throughout the movie, which makes him very hot indeed. I'm not going to give it away to those who haven't seen it yet, but this movie also contains one of the most well acted death scenes I've seen on the screen. Jack Vincennes definitely gets my vote! 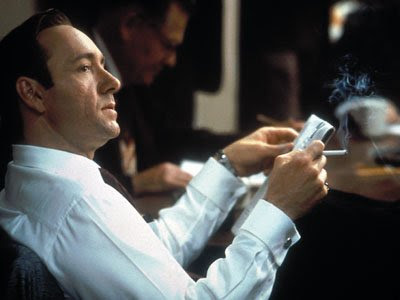 I became a fan of Kevin Spacey shortly after watching his performance as Jack Vincennes in L.A. Confidential. Still one of my favourite films of all time. A few years ago, I attended a talk with with Curtis Hanson at London's National Film Theatre, it was very interesting to hear the director's experience working on LAC.